NEW YORK -- Join ABC7 and the Apollo Theater on September 26th, for "Apollo Uptown Hall: Presidential Debate Watch." This viewing party of the highly anticipated first presidential debate between Democratic and Republican nominees Hillary Clinton and Donald Trump happens Monday, September 26, 2016 starting at 7:30 p.m.
Stay for the debate but also come for the entertainment and the discussion: Before the screening, Hot 97 and WBLS' DJ Enuff will spin music and Amateur Night at the Apollo's Charisa the Violin Diva and the MTA's MUNY Diverse Concert Artists will perform. Then Keli Goff of The Greene Space at WNYC and WQXR's Political Party with Keli Goff event series hosts an interactive panel discussion with experts The American Conservative's Scott McConnell, Black Enterprise's Derek Dingle, Univision 41 News' Mariela Salgado, and political analyst Amy Holmes addressing the election's importance to Harlem and beyond. Channel 7 Eyewitness News anchor Rob Nelson will take part, helping participants share their questions and thoughts with the panel. The New York Public Library is taking part as well: Showcasing politically-themed books, CDs and DVDs. The Women's Political Caucus of New York's will be there, and eligible voters can register on site at their table. This event is free, but registration in advance is advised. 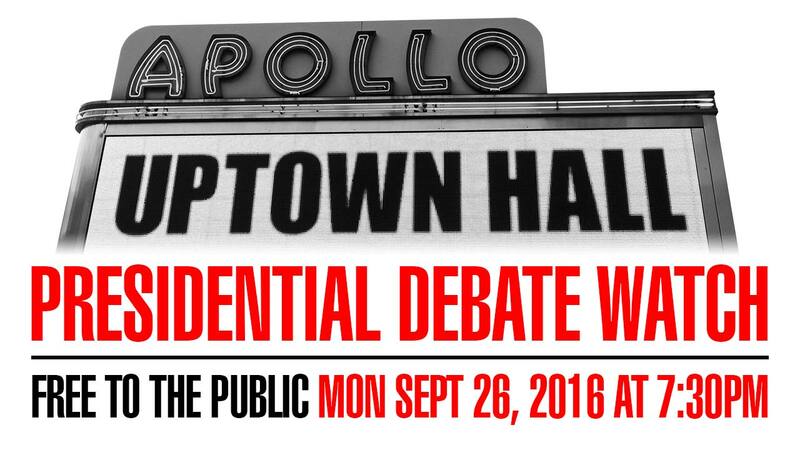 Visit https://www.apollotheater.org/event/apollo-uptown-hall-presidential-debate-viewing-party/ to register.